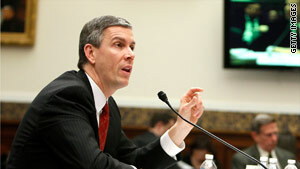 Education Secretary Arne Duncan says two states will get education funds under the "Race to the Top" program. Washington (CNN) -- Tennessee and Delaware were the only two states designated Monday to receive funds in the first round of the education funding competition "Race to the Top," federal officials announced. Delaware will receive $100 million under the program, while Tennessee will receive $500 million. Secretary of Education Arne Duncan said in the announcement that one determining factor was that "both states have statewide buy-in for comprehensive plans to reform their schools. They have written new laws to support their policies. And they have demonstrated the courage, capacity, and commitment to turn their ideas into practices that can improve outcomes for students." The states are the only two left after 40 states and the District of Columbia initially applied for the program. To receive the funds, the states had to prove that they were progressing in specific areas including turning around low-performing schools, adopting college- and career-ready standards, and using data systems to support student achievement. Are your schools in trouble? Race to the Top is an Obama administration program that is funded under the American Recovery and Reinvestment Act to reward states for aggressively reforming their education systems. The $4.35 billion is to be awarded in two phases to an undetermined number of states. Several state governments have changed their state laws to make themselves better positioned to receive the funds. Both Tennessee and Louisiana changed their charter school laws to meet Race to the Top criteria, and California dropped from its books a law that made it illegal to tie teacher evaluations to student performance. California did not make the cut in Phase 1 of the program, but could still qualify for the funds in Phase 2. Louisiana made it to the top 16. Some states decided not to compete for the funds. In January, Texas Gov. Rick Perry sent a letter to Duncan explaining why his state would not be applying for Race to the Top funding. The letter stated, "I will not commit Texas taxpayers to unfunded federal obligations or to the adoption of unproven, cost-prohibitive national curriculum standards and tests."